You see glow in the dark stuff in all kinds of places, but it is most common in clothes. Glow in the dark clothes are great for parties and they make kids easy to find at night. No doubt that you have seen glow in the dark clothes, and you know that they all have to be “charged”. You keep them close to a light, and then wear the glow in the dark clothes to a dark place. In the dark they will glow anywhere from 10 minutes to several hours. Usually it is a soft green light, and it is not very bright. You need to be in a very dark place to notice it’s properties. All glow in the dark clothes contain phosphors. A phosphor is a substance that radiates visible light after being energized. The two places where we most commonly see phosphors are in a computer monitor and in fluorescent lights. In a monitor, an electron beam strikes the phosphor to energize it. In a fluorescent light, ultraviolet light energizes the phosphor. In both cases, what we see is visible light. A screen actually contains thousands of tiny phosphor picture elements that emit three different colors (red, green and blue). In the case of a fluorescent light, there is normally a mixture of phosphors that together create light that looks white to us. Cloth in general presents some interesting problems for glow in the the dark pigments and paints. 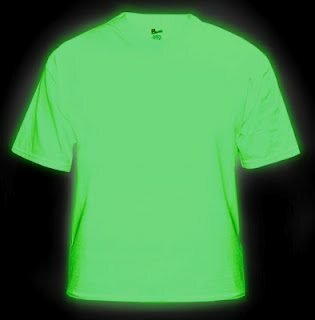 There are several techniques to create glow in the dark clothes that are popular. Standard painting techniques are easy for everyone to use in making custom glow in the dark clothes. “Dust Dying” and “Glow Ink” are also products that can be used to make great custom looks. Each of these methods has its own benefits and uses that set it apart. Glow in the dark clothes paint and blacklight paint for fabric glows real bright. It adheres to every fabric as well as glass, metal, plastic, and wood. Dries waterproof. If you heatset it on fabric, it’s washfast so you can use it on clothing that gets washed. It can be painted, airbrushed, sprayed, or applied with applicators. It can be used to illuminate anything in the dark: light switches, stair treads, etc. It glows from any light source! It glows very brightly from blacklight. Cleans up with soap and water and it’s Non-Toxic. Paint will not flex freely with the cloth of a garment. Therefore, you need a paint that has strong adhesion and at least some flexibility without cracking. This also means that you need to paint designs, letters, or small patterns as opposed to covering a whole garment to allow flexibility in the non-painted areas of glow in the dark clothes. To accomplish this, you can use glow in the dark paints, which are solvent-based acrylics. They have strong adhesion and moderate flexibility. Put Glow in the Dark powder into a very large plastic bowl. Put the material or garment into the bowl and work the powder into the material. Remove the garment and push it back into the bowl several times pressing hard to push the powder into the weave of the material. Continue this until the weave of the material is packed with glow particles. Spray the glow in the dark clothes garment with clear spray paint called airbrush sealer to permanently seal the powder into place.